The United Wa State Party has pledged to crack down on opium production in northeast Myanmar. However, as Pierre-Arnaud Chouvy reports, ridding the area of opium without providing alternative income sources could be devastating for the majority of the Wa population. One million ethnic Wa live in Myanmar and China but those living in Myanmar have been denounced as a security threat in Southeast Asia, although they are actually more often at the mercy of drug cultivation in the region than profiting from it. Around 400,000 ethnic Wa are believed to inhabit the northeast Shan State of Myanmar, with an additional 600,000 in the Yunnan province of southeast China. Very little has been written on the Wa, except in Chinese, between Sir James G Scott’s Gazetteer of Upper Burma and the Shan States in 1900-01, and Magnus Fiskesjo’s unpublished PhD dissertation The Fate of Sacrifice and the Making of Wa History in 2000. Most of what has been written has been concerned with the 20,000-strong United Wa State Army (UWSA), the military wing of the United Wa State Party (UWSP). But it has been the whole Wa population, rather than just the UWSA, that have been said to « challenge regional stability in Southeast Asia ». Thailand, the main consuming market of methamphetamine pills (yaa baa), has long been keen to advocate this view, and Bangkok has repeatedly denounced the UWSA as being the main threat to its national security. Although some elements of the UWSA are involved in illicit drugs production and trafficking (opium, heroin, and methamphetamine), the Wa as an ethnic group find themselves vulnerable to the economics and geopolitics of drug cultivation. The United Nations Office on Drugs and Crime (UNODC) estimated that 62,000ha of opium poppies were cultivated in Myanmar in 2003, down from 81,000ha in 2002. Critics, mostly using Shan sources, said the decrease in the north of Shan state was more than made up for by a marked escalation in the south and east. However, the US International Narcotics Control Strategy Report also confirmed that Myanmar’s poppy cultivation decreased, and quoted figures even lower than UNODC. UNODC estimates are deemed the most reliable since they do not only monitor illicit crops through remote sensing, but also conduct extensive ground surveys and integrate them with their interpretation of satellite images, something that the USA cannot do. UNODC estimated that in 2003, 92% of Myanmar’s 810 tonnes of opium originated in Shan State. UNODC also estimated that 34% of all Myanmar’s opium production in 2003 took place in the Wa ‘Special Region Two’ (the territory administered by the UWSP and controlled by the UWSA in Shan State), an increase of 21% on 2002. And in 2003, the largest decrease of opium production took place in the north of Shan State, while significant decreases also occurred in the southwest and southeast of the region. UNODC officials said the production increase in Special Region Two is in part due to a 50% drop that occurred in northern Shan state’s Kokang area, which caused a drift of opium farmers and production into the north of the region. Kokang authorities issued an opium ban in 1997 to make the Kokang ‘Special Region One’ an opium-free zone by 2001. The region witnessed considerable diminution of its opium poppy cultivated areas as soon as 1998. Between 2002 and 2003 another 60% reduction took place in Kokang. Such a drastic reduction of the main cash crop in such a short time in an area where rice shortages are severe has had dire consequences on the local population. In an area where 80% of the people produced opium mainly to bridge such shortages, the World Food Programme had to rush in emergency assistance. The Kokang experience does not bode well for the Wa and their similar opium suppression commitment. Ironically, the largest increase in opium production in Special Region Two, where UNODC launched its Wa Alternative Development Project (WADP) in 1998, happened after the Wa authorities committed themselves to rid the region of poppy cultivation by 2005. 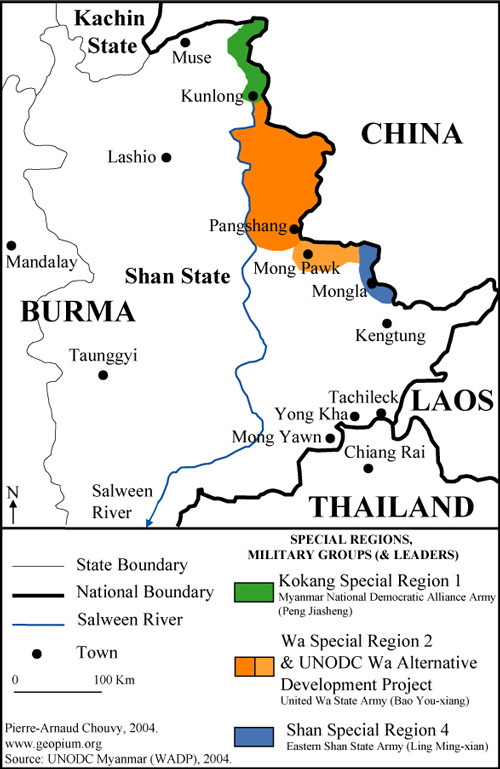 The WADP area is located east of the Salween River and south of the Chinese border, south of the Wa capital Panghsang. It extends, over five townships (Mong Hpen, Mong Pawk, Ho Tao, Mong Kar, and Nam Phai) that spread over 1,300sq km. The WADP benefits 40,000 ethnic minority people, or 7,800 households, of which almost 50% cultivate opium poppies. In 2003, 775ha of opium poppies had been cultivated in the WADP area, down from 956ha in 2002 (-19%), and after the authorities eradicated 55ha of planted opium poppy, only 720ha were potentially harvestable. Although Special Region Two and the WADP area are controlled by ethnic Wa, 12 different ethnic groups compose the population of the WADP area, out of which 50% are Lahu, 12% Wa, and 10% Akha. When it comes to opium production, the Lahu accounted in 2003 for 63.8% of opium poppy cultivators, the Akha for 11.6%, and the Wa for only 9.7%. As is commonly the case with highland tribal people in Southeast Asia, the Wa relied mainly on hill rice species grown under regimes of shifting slash and burn cultivation. Irrigated rice paddies were and still are scarce, even in those rare valleys where irrigation is possible. While Wa people in China have resorted to irrigation since the 1950s, it is only during the last few years that they have employed it within Myanmar. The main cash crop of the Wa has been, and still is to a large extent, opium, which became widespread in Southeast Asia’s northern uplands by the late 19th century. As is still the case, very little opium was consumed in the historical central Wa country, except for medical purposes (in 2003, only 0.8% of the population of Special Region Two have been found addicted to opium). Myanmar’s overall opium economy is the outcome of a long-lasting political crisis and a protracted internal armed conflict, where the illicit economy is fuelled by the war economy and vice-versa. Opium production still appears to many as the only viable means to compensate for structural shortfalls in food security at the small-scale level of the peasant economy. Three-quarters of the population of WADP area suffer from rice shortages for four to six months of the year. UNODC wants to address this situation by providing both alternative income (cash crops) and more intensive agricultural techniques, mostly through the double cropping of rice (for example, better land use, irrigation and improved varieties of rice). The Wa have launched a large scale rubber tree plantation around Panghsang, and China, where most Myanmari heroin is trafficked, and whose border runs along the outskirts of the city, has promised the tax-free import of the Wa rubber in an effort to help with opium suppression. The central government of Yangon has granted the Wa a level of autonomy that no other tribal group or political or military organisation has ever gained in the country. The UWSP/UWSA controls the development of its territory (for example, military, politics, economics, health, education and infrastructure). However, this huge opportunity that the Wa have in Myanmar, where a ruthless military dictatorship still clings to power and makes concessions only when it has no other choice, must be used most cautiously by its leadership if it does not want to jeopardise its very stability and existence. Seemingly willing to change both its image and its status, the Wa leadership still claims that it is committed to get rid of opium production by 2005, something that, if achieved at such a pace and in such material conditions, would prove extremely detrimental to its population. Although the UN and various non governmental organisations (for example, Germany’s Malteser and France’s Aide Médicale Internationale) are working in Special Region Two to improve the people’s economic and health a quick and drastic change could threaten both Wa socio-political stability and the status quo that the Wa enjoy with Yangon. UNODC, whose very presence in the area is highly criticised by many pro-democracy advocates, also tries to guide and advise the Wa leadership in how to achieve what is a self-imposed goal. For example, UNODC has tried to soften the humanitarian impact of the Wa authorities’ policy of forced relocation of opium poppy growers from uplands to lowlands within the WADP area. The UWSP leadership estimated that the northern Wa region could not sustain its current population after the ban on opium production, and moved 40,000 to 50,000 people from the northern Wa region to the southern Wa region along the Thai border. This region is where the UWSA holds territorial enclaves gained in the mid 1990s in its struggle against Khun Sa’s Mong Tai Army. There, between Mong Yawn (recently renamed as Yong Pang, which means prosperity) and Yong Kha, only Thailand’s Yong Kha Development Project has started working with the Wa, replicating the alternative development scheme successfully developed since 1988 in Chiang Rai’s Mae Fah Luang district (Doi Tung). The Yong Kha Development Project received US$512,000 from the Thai government, but suffers from the same criticism as WADP. Security officers with the Thai Pha Muang Task Force, who are in charge of drug suppression operations along the Myanmari border in Chiang Rai and Chiang Mai provinces, estimate that both UNODC and people in charge of the Yong Kha Development Project are being deceived by the UWSA and Yangon. For project chief and Doi Tung Secretary General MR Disnadda Diskul, the progress is underway in development projects at Yong Kha, where villagers are encouraged to substitute licit plants for the opium poppy – especially macadamia nuts – for export to China. He stressed the fact that no solution to drug production and trade can be found without improving the perceptions that the Thai and the Wa have of each other. Both UNODC and Yong Kha project management believe that efforts must be made toward more community-based development and cross-community trust building if opium suppression is to be successful. No matter how committed the UWSA leadership may be, it still has to face a highly complex geopolitical chessboard in which many powerful actors are deeply involved in the drug trade. For example, both Yong Kha and Mong Yawn are under the control of Bao You-yi, brother of UWSA leader Bao You-xiang and political commissar of the 171st UWSA Military region based in Mong Hsat district. From 1996 the 171st UWSA military region was under the military command of drug trafficker Wei Hsueh-kang (who is wanted in Thailand and the USA with a $2m price on his head), until his alleged removal by the UWSA in 2002. At that time Bao You-yi claimed that Mong Yawn was clean of drugs after the May 2002 arrest of Wei Sai-tang, former UWSA senior commander of Mong Yawn’s 2,000 troops. Many critics argue that although the UWSA has to some extent succeeded in opium eradication, it has also let the production of methamphetamine jump dramatically. This is especially true of the 171st UWSA Military region, where Wei Hsueh-kang has been swift to diversify into methamphetamine production. Bao You-yi affirmed that Wei Sai-tang has been arrested and condemned to a 50-year jail term in Panghsang and that Wei Hsueh-kang is no longer in command of the 171st Brigade. Xiao Ming-liang, the deputy secretary of the UWSP, told JIR: « The Wa will suppress opium production with or without help from the international community. » The Wa leadership hopes to receive international help to sustain this move even though it could jeopardise the regional balance of power by threatening the fragile social, political, and military stability of Special Region Two. The risk is that, whether they succeed or not, the UWSA will not get any help from an international community that imposes sanctions on Myanmar and views the UWSA mostly as a drug trafficking organisation. On 2 June 2002, US President George W Bush notified Congress that the UWSA had been added to the Foreign Narcotics Kingpin Designation Act list. Inclusion on this list makes it illegal for any company, either US or foreign, trading with the USA, to do business with the UWSA. The initial list, released in June 2000, included Khun Sa and Wei Hsueh-kang. Then, in August 2002, the USA banned imports from Myanmar and froze US dollar remittances. The WADP, which has recently suffered from a shortage of funds, is financed by Japanese, US, Australian, German, and Italian money. Jean-Luc Lemahieu, chief representative of UNODC in Yangon, and Yong Kha project chief Disnadda Diskul have suggested that the Wa-enforced opium cultivation ban, along with inadequate developmental help, could lead to a major humanitarian crisis after 2005. Given the timescale for such an effort, combined with international sanctions that will forbid the necessary aid to reach either dictatorial Myanmar or the UWSA, it is unlikely that alternative ways of living will be developed before the opium ban takes effect, and therefore rural communities risk being sacrificed. Since opium suppression is clearly not sustainable without outside aid, it is the Wa people who will suffer most from both the ban and the economic sanctions, while opium production may only be displaced elsewhere in Myanmar. Connexion | 56 queries. 0,367 seconds.